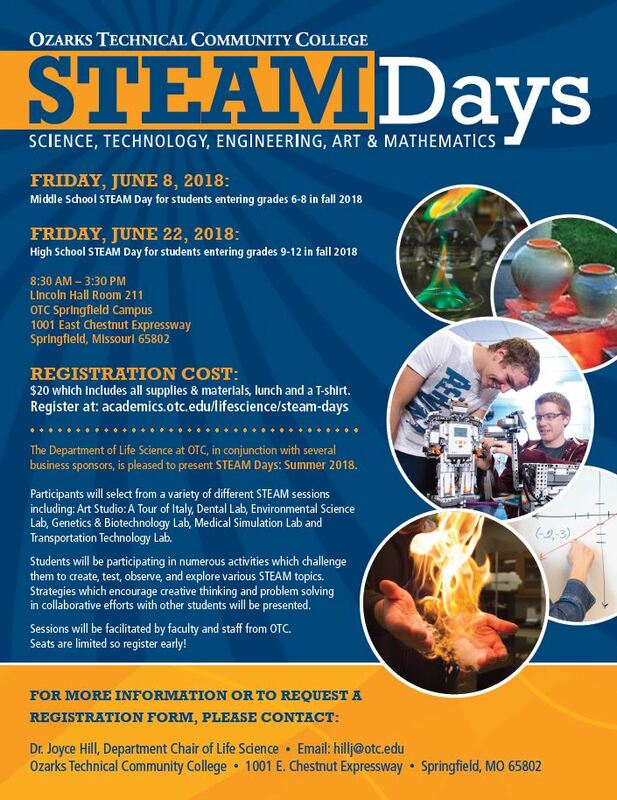 The Department of Life Science at OTC, in conjunction with several business and industry sponsors, will be presenting the 4th Annual STEAM Days for Summer 2018. Participants will select from a variety of different STEAM sessions including; Art Studio: A Tour of Italy, Dental Lab, Environmental Science Lab, Medical SIM Lab and Transportation Technology Lab. Students will be participating in numerous activities which challenge them to create, test, observe, and explore various Science, Technology, Engineering, Art & Mathematics (STEAM) topics. Strategies which encourage creative thinking and problem solving in collaborative efforts with other students will be presented. Sessions will be facilitated by OTC faculty and staff, and seats are limited, so register early!